Today’s National Donut Day! Who doesn’t love a day that revolves around donuts? I have been looking for different varieties of baked donuts, there’s really no end to what can be made. These donuts are delicious! 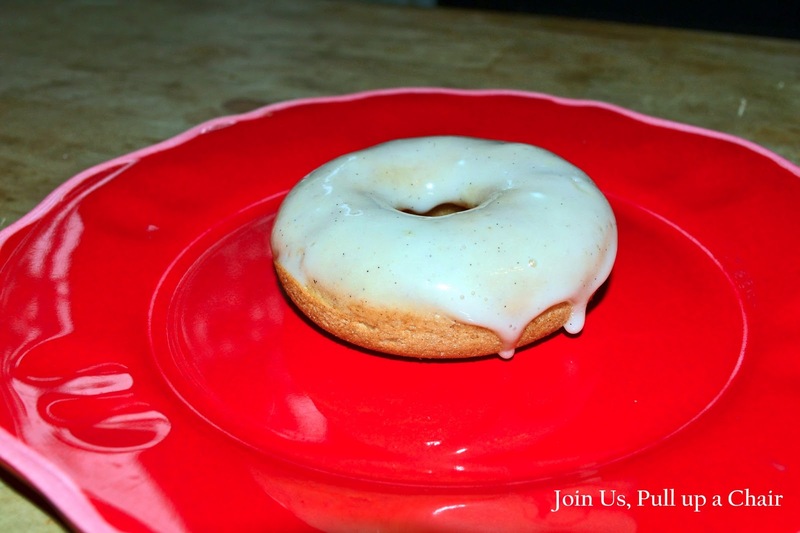 I love the cinnamon bun flavor and the fact that they’re glazed with a delicious vanilla cream cheese glaze. I have a feeling the half dozen donuts I made will be gone in no time at all. Preheat oven to 325 degrees. Lightly grease a donut pan and set aside. In a large bowl, combine the flour, sugars, baking powder and cinnamon. Add in the wet ingredients – butter, egg, vanilla and melted butter. Stir to combine all the ingredients. Place the batter into a ziplock bag. Snip the corner and pipe the batter into the donut pan, filling each 3/4 way full. Bake for 10 to 12 minutes or until the donuts spring back and are lightly browned. Remove from oven and place on a wire rack to cool. While the donuts are cooling, make the glaze. Combine all the glaze ingredients and whip together with a whisk. After the donuts have cooled for 5 minutes or so, remove from the pan and dip into the glaze. Place on a wire cooling rack to continue cooling. Devour!